In carrying out the mission of Christ in our day, we first renew our life of prayer and sacred worship. The renewed life of prayer leads, in itself, to the thirst for renewed knowledge of Christ and His Body, the Church, in order to be a co-worker with Christ in the sanctification of the world. The Holy Father’s words can leave no doubt of the seriousness of the challenge and of the depth of commitment required to meet it. Father John A. Hardon, S.J., of blessed memory, because of his strict adherence to the Holy Father’s magisterium and his unceasing apostolic zeal, according to his vocation as a religious and priest, anticipated the Holy Father’s appeal for the new evangelization, the new Christianization of America, by founding the Marian Catechist Apostolate or the Association of Marian Catechists and directing the association until his death in December of the Great Jubilee of the Year 2000. The foundation of the Marian Catechists was a response to the request of our Holy Father that Father Hardon organize a catechetical training program for the Missionaries of Charity of Mother Teresa of Calcutta. The program for Mother Teresa’s Sisters developed into a program of spiritual and doctrinal formation for catechists in our country and far beyond. In the case of the Missionaries of Charity, Father Hardon was to prepare the Sisters to evangelize those who had never been taught the Catholic faith in the many missionary regions of the world. In the case of the Marian Catechists, Father Hardon was to prepare lay catechists to evangelize anew those who are Christian in name but do not know their faith or know it very poorly or in a confused way. During the Great Jubilee of the Year 2000, Father Hardon published the Marian Catechist Manual, the vademecum of the members of the Marian Catechist Apostolate. It describes the purpose, formation, spirituality and spiritual practices, theological foundations, scope, means employed, and standards of conduct of the Marian Catechists. When we reflect upon the erosion of faith in the Holy Eucharist in our time; the widespread absence of Catholics from Sunday Mass; the loss of devotional life in homes and parishes; the difficulty in finding sound catechetical texts; the confusion in catechetical texts and among catechists about basic Catholic doctrine and practice; the public dissent from Catholic teaching by those who by their vocation have a special bond of obedience to the Holy Father and the Church’s Magisterium; the moral defection of Catholics regarding the evils of artificial contraception, procured abortion, contraceptive sterilization, euthanasia, cohabitation before marriage, and homosexual acts; the open disloyalty to our Holy Father; and the unreadiness of youth to make a lifetime commitment and the ready abandonment of fidelity to promises made before God and His Church, we understand more fully why Father Hardon was so passionate, up to the last days of his life, in furthering the Marian Catechist Apostolate and safeguarding it from erosion by the multiple forces of confusion and dissent in our country. Father Hardon was equally passionate in insisting that God’s grace is available in super-abundance for us to meet the grave crisis of faith in our time and in our country, and to move beyond it through a new teaching and living of our Catholic faith. The example of the early Christians who faced fierce persecution in teaching and practicing the faith was his inspiration in calling for a no less heroic witness on the part of Marian Catechists. He worked tirelessly so that the Marian Catechist Apostolate might tap “the infinite storehouse of graces” which God provides for us at this critical time in the life of the Church. The Marian Catechist Apostolate responds precisely to the principal ways which our Holy Father sets forth in Novo Millennio Ineunte for the new Christianization of culture. The Marian Catechists are, first of all, formed in prayer and sacred worship, and in the spiritual life. Our spiritual life is the principal textbook from which we are to instruct others in the Catholic faith. (MCM, p. 46) The Marian Catechist Manual gives a description of the four spiritual qualities which the Marian Catechists seek. The doctrinal formation of the Marian Catechists is provided through Father Hardon’s 16-lesson Basic Catholic Catechist’s Home-Study Course and the 36-lesson Advanced Catholic Catechist’s Home-Study Course. These courses provide a complete and systematic study of the doctrine of the faith. They are based on the Catechism of the Catholic Church. In order to assure the correct understanding of the content of the courses, there are questions posed at the end of each unit. The responses are sent to a central office, at which they are corrected. Explanations of the correct answers are provided. After completing the Advanced Course, the Marian Catechists are encouraged to complete Father Hardon’s course on the Spiritual Masters. They are also encouraged to deepen their knowledge and practice of the faith by studying Father Hardon’s writings and listening to an excellent series of audiotapes produced by Eternal Life. Eternal Life has published a number of Father Hardon’s books, including his very helpful Modern Catholic Dictionary. Eternal Life is in the process of publishing Father Hardon’s unpublished manuscripts. Ave Maria University Press has published earlier this year his volume on the Eucharist. Soon it will publish his volume on the history and theology of grace. The resources available to the Marian Catechists for doctrinal formation are more than sufficient and are thoroughly reliable, coming from the hand of Father Hardon. With regard to the methodology of catechesis, the Marian Catechists study the General Directory for Catechesis, using a commentary which I have prepared and Father Hardon approved for the use of the Marian Catechists. It, too, has a series of questions at the end of each unit, to which the catechists respond, in order to assure their correct understanding of the material. 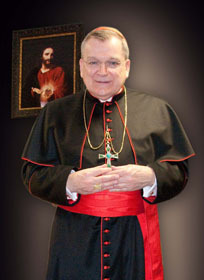 Father Hardon also provides for Marian Associates who are unable to meet the requirements to be a Marian Catechist but “want to assist the apostolate of Marian Catechists by providing regular financial or other support.” (MCM, p. 90) The apostolate is of such importance and faces such challenges, that it needs the cooperation of many to fulfill its purpose. It is these qualities, which must be the foundation of anyone who undertakes the apostolate of catechesis, that the Marian Catechists aspire to imitate. The motto of the Marian Catechists is the words which our Blessed Mother spoke to the wine stewards at the Wedding Feast of Cana: “Do whatever He tells you.” (Jn 2:5) (cf. MCM, p. 1) Every Marian Catechist prays to do all that Christ asks and to lead those catechized to do the same. The Psalmist cries out in Psalm 11, “if the foundations are destroyed what can the righteous do.” (Ps 11:3) Our Holy Father provides us the answer: pray, study God’s word and teach others the Word of God. The foundations which are catechesis in the Church have been attacked and weakened, but they can be built up anew and strengthened. The Apostolate of Marian Catechists sets forth as its purpose to do just that. Virgin of Guadalupe, Mother of America and Star of the New Evangelization, pray for us.